My new blogger template. I have no idea to call it, I just call it " White Slide". Simple and clean template. 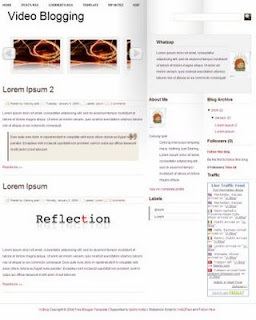 You can use this template maybe for your personal blog, video, or photo blog. It has featured slide at the top of main post so you can put your favorite image. At the right side I put message box, so you can show your status or Quote of The day. Here is the screenshoot. As I promise, here's xml file including setting instruction. More question you can email me. Because of bandwidth exceeded, this script sometimes doesn't works. Great...!! Your themes design are perfect. dua jempol buat template ini, bong! keren! kene photo mu bong..., tak pasange nang slede-ku. super nice template.. i can't wait for the code. I plan to use it for my http://fave-tv.blogspot.com blog.. i hope you can lend some help in the installation..thanks a lot..
just trying your adorable little cartoon characters..
weleh weleh bong, itu ada orang malaisya juga blong..
mbak bong, plis beri nilai template saya dong??? salutos cokolatos... deh ama ipiet, eh ini ijo yah bukan coklat, dah rabun saya, abiz ijo sih, mata saya jadi ijo juga. I tried putting images in the slide but the slider effect is not working what maybe the problem. Please Help me. On Step Carousel, the navigation buttons (leftnav, rightnav) don't show up. Don't know how to fix it. @serafim : Because of bandwidth exceeded, this script sometimes doesn't works. @cush: dont you have winzip or winrar? Hi. I would like to remove the featured slide bit. can u please teach me how to do it? Thank you.